The Miami International Chess Academy will be hosting the 1st annual Miami Chess Open on 26-30th September. The fantastic $100.000 prize fund is based on 650 entries, $50.000 are guaranteed. Sheraton Miami Mart Hotel, 711 NW 72 Ave, Miami, FL 33126 (near Dolphin and Palmetto Expressway). Five minutes away from Miami International Airport, Fifteen minutes away from Miami Sea-Aquarium and world famous South Beach with it’s amazing nightlife. 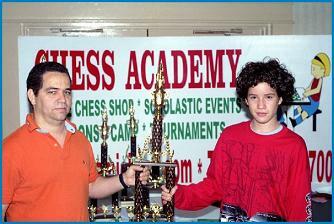 The Sidney Samole Chess Hall of Fame also makes its home in Miami Florida and welcomes you to visit. Miami’s biggest malls are nearby (Dolphin Mall, International Mall, Mall of the Americas). General Info: 9 rounds of Swiss system will be played, time control is 90mins with 30 seconds increment for the whole game. Section will be rated with FIDE and USCF, GM and IM norms are possible. Unrated players must enter U1100/Unr or Open Section. Prizes: $12000-$5000-$3000-$1500-$1000-$700-$600-$500-$400-$400. Bonus for clear first place is $200. Prizes for 2300-2499 are $2000-$1000. Under 2300/Unr $3000-$1500-$700. If tie for first, top two according to tiebreaks will play speed game for title and bonus prize. Mailed entry fee: By 7/15 – $205, by 8/15 – $225, all $250 at site . All sections except U1100/Unr will pay the same. No checks at site, credit cards are accepted. Online entry fee is available at www.miamichess.com: By 7/15 – $210, by 8/15 – $230, by 9/25 – $255. Phone entry fee (305)262-2700: By 7/15 – $210, by 8/15 – $230. Under 1100/Unrated Section entry fee: $30, $30 phoned to 305-262-2700, $45 at the site. General Info: 7 round of Swiss system will be played, time control is 90mins with 30 seconds increment for the whole game. Under 1100/Unrated Section: Trophies to top 10. For playing schedule, entry form, prize limits and other information, visit the official website. Thank you IM Blas Lugo for the tournament details.